A photograph or video of a character from the television show Sesame Street* will generate an instant smile of happy recognition in nearly every corner of the ...world. Adults and children have been touched, taught, reassured, and entertained for more than 40 years by the creative programming produced by the nonprofit educational organization Sesame Workshop. The mission of Sesame Workshop is to use the educational power of media to help children everywhere reach their highest potential. Beyond television, Sesame Workshop produces content for every form of media, from books and videos to the latest in interactive technology. Achieving this mission requires a sophisticated mix of high creativity and high technology. ”Sesame Workshop is a global media company, and bandwidth and speed are key as our IT infrastructure supports users across the Sesame Workshop production, distribution, editorial, creative and business teams,” said Shadrach Kisten, vice president information systems, Sesame Workshop. Sesame Workshop was looking to “go green,” and was virtualizing its internal production data center in New York City. At the same time, the Workshop was planning to redesign its disaster recovery (DR) facility in northern New York. Kisten and his team needed to choose technology that would ensure performance, availability, and efficiency. 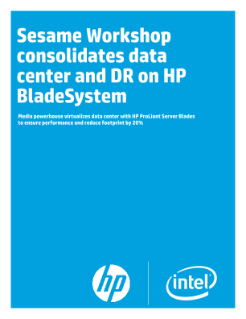 Read the full Sesame Workshop Consolidates Data Center and Data Recovery Case Study.